The Peralta Colleges are offering upcoming programs abroad led by faculty in Belize, Iceland/New Zealand, England, Germany, Egypt, Ghana, China, Japan/Taiwan, and Mexico. Deadlines are quickly approaching for certain programs! 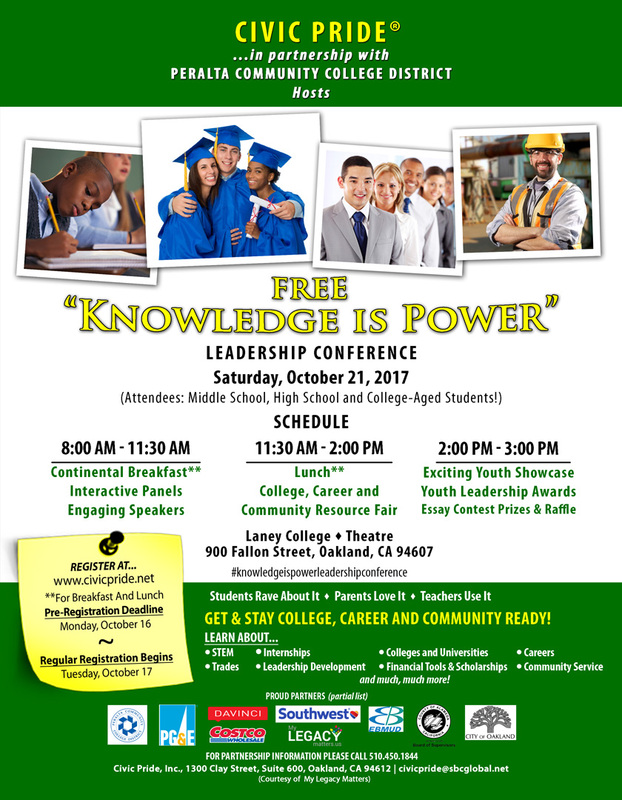 A Community College Education and Your Pathway to a Career is in the Neighborhood! 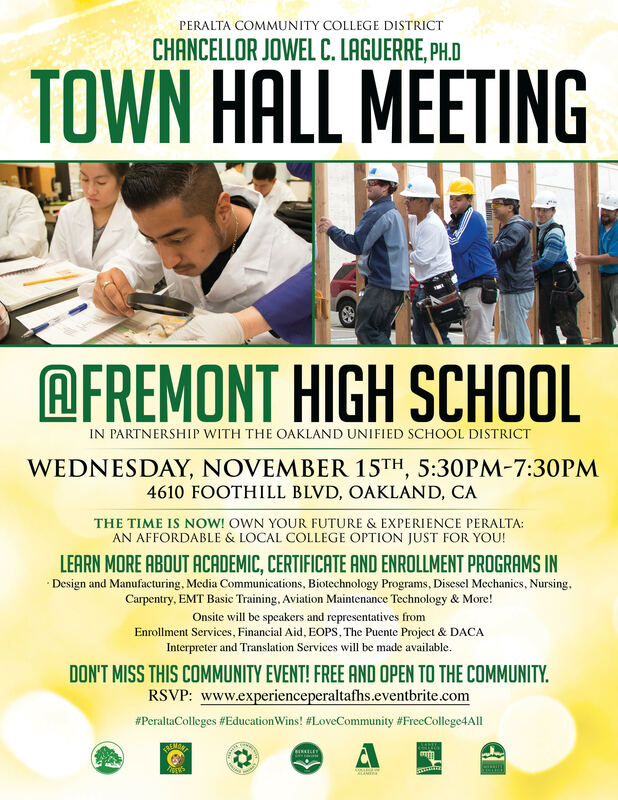 In partnership with Oakland Unified School District, Peralta Community College District Chancellor Jowel Laguerre and Board Trustees are excited to host its next Chancellor’s Town Hall Meeting on Wednesday, November 15th, at Fremont High School, 4610 Foothill Blvd, off High Street in Oakland from 5:30 pm – 7:30 pm. The Chancellor’s Town Hall Meeting, a series of community conversations, showcase Peralta Colleges’ wealth of career technical and academic programs, throughout the Peralta Colleges district community areas. At the Town Hall Meetings, a suite of enrollment services and representatives are also on-hand to provide information on financial aid, admissions, counseling and more, in an effort to assist potential students to navigate the process with ease. Last month Governor Jerry Brown signed new legislation to make community college free for all full-time students in California. Peralta Colleges and Oakland Unified School District’s collaborative work aims to ensure our communities are aware of the new law to increase the number of students who enroll in community college full-time, as well as the number of people who are prepared for careers that support their families. Light food, networking and information table highlighting career technical and trades programs will begin at 5:30 pm in the Cafe. The program presentations will take place in the Auditorium with OUSD staff and a conversation with Peralta Chancellor Jowel Laguerre and Peralta alumni. The town hall meeting is free and open to the public. To RSVP, visit www.experienceperaltafhs.eventbrite.com. Good Afternoon Colleagues, As you may know, earlier this month the Mission Asset Fund (MAF) announced a scholarship fund to help young immigrants pay for the $495 DACA renewal fee. Today, the fund is announcing it has now tripled in size to reach $3,000,000—enough to help 6,000 Dreamers renew their DACA permits for two more years. 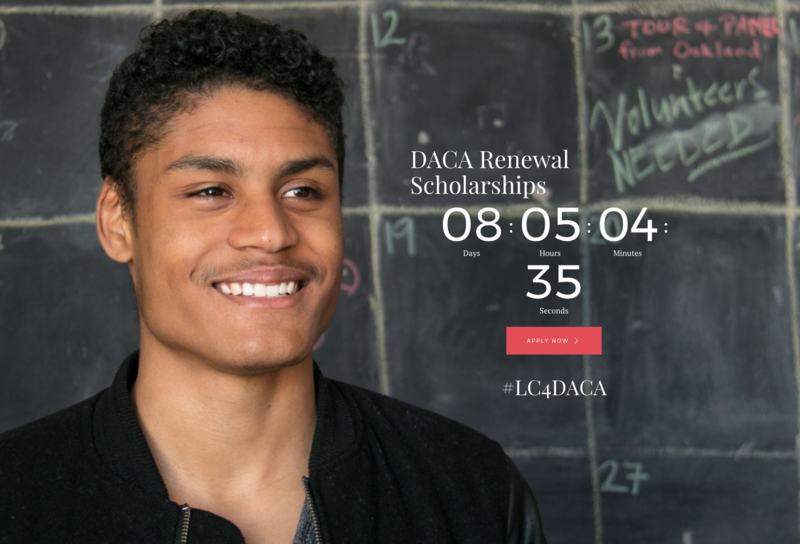 To date, 4,000 scholarships have already been issued, with 2,000 scholarships still available—making this DACA renewal fund the largest of its kind in the nation. It is also important to note, close to 900 of the applications received so far are from California community college students. There is a great deal of support for the young people who know this country as their only home. California Dreamers, many of whom are our students, want to live life outside of the shadows — so that they can study, earn a degree or certificate, work and build a future for themselves and their families. DACA was the salvation that brought them into the light of day. Back in 1980’s Dennis Makishima was working as a gardener in the East Bay hills, and wanted to expand his training in the field of Horticulture, so he started attending classes in the Landscape Horticulture department. Dennis Makishima was able to impart his skills and horticultural understanding into a successful series of courses designed to help students into a career that cultivated specialized pruning skills. Dennis has taught hundreds of students and mentored many into lucrative careers of service to the East Bay and beyond. The Merritt Pruning Club has a 30-year history of mentoring and service. The Apprenticeship model of training and the Aesthetic Pruning club’s’ mission has benefited many gardens in the East Bay. We are grateful to ALL the founding members and appreciate the skill and enthusiasm which has lasted and still inspires our community. 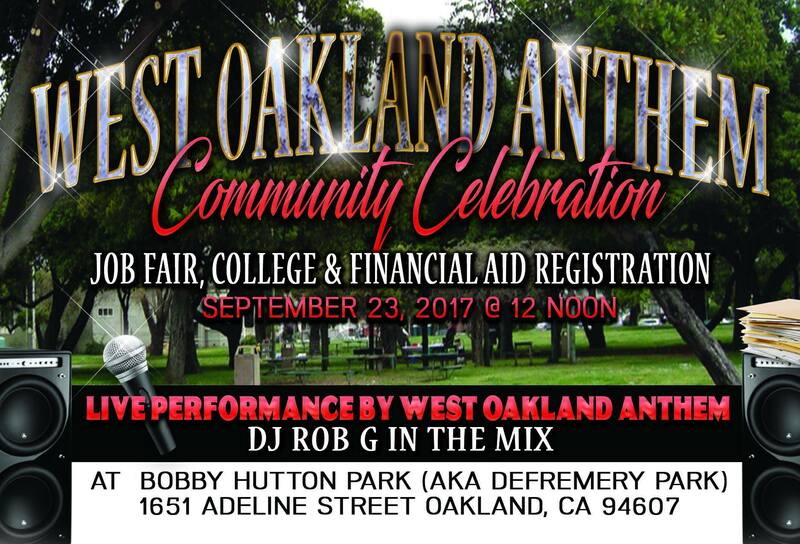 The 30 years of continuous service to the community, here and throughout the world, had its beginnings here at Merritt College. Pete Churgel, Yuki Nara, Randall Lee, and Bill Castellon and of course Michael Alliger, all extraordinary teachers, and Tom Branca assisted the program forward. For more information, contact Tamika M Brown, email: tmbrown@peralta.edu. After the election of President Donald Trump, the District Board of Trustees took a very active stance supporting our Undocumented Students and all students who had reasons to be concerned about any potential unjust actions of the Trump administration. Today, we are saddened that the administration has taken the position to end, within six months, the protection provided by DACA. Deferred Action for Childhood Arrivals (DACA) is a program that represents the decency of America. DACA protects children who were brought to this country and who have grown up as Americans in all the sense of the word. Often called “dreamers,” these children have been integrated into the culture of our schools and have embraced our values: America is their country. DACA students have demonstrated their commitment to be productive citizens and to keep our country strong and great. Some have served in our military, some have earned degrees, and many have filled jobs that in our country that has strengthened our economy. We recognize the many accomplishments of DACA students and acknowledge their role in our democracy and their contributions to our society: they are lawyers, physicians, teachers—they are productive members of our communities. At Peralta, we have hundreds of students who fit the DACA category, and they are among the best citizens we have. The Trump administration’s abrupt decision to end DACA is unwise and appeals to a political base that has proven out of step with the majority of America. For this reason, we need to do everything we can to provide the immediate support needed for our students. In fact, community colleges throughout the State of California are stepping up to be supportive of all DACA students. We will schedule legal workshops at the Colleges as soon as possible so that DACA students can learn about their rights and seek legal protection. We will advocate through Congress and the White House to develop a permanent, fair, humane, and smart solution to making every “dreamer” a documented and respected citizen of the United States. We will encourage our local legislators and community leaders to join us in lending their public support to this effort. We will assure that all PCCD students– and especially the DACA students– know they are not alone in these troubling times. Most importantly, our students need to know that their Faculty, the Staff, the Board of Trustees, the Chancellor and the College Presidents are watching out for them and that everyone in the United States is protected by the U.S. Constitution. The rights of DACA students are not exceptions to these protections. Will not allow College police to participate in any voluntary program of immigration enforcement. PCCD remains deeply committed to all of our students and will do everything we can to ensure their success and safety. Currently, we are witnessing a troubling period in our history and we will do everything in our power to win back the values and ideals that make our country the beacon of hope and opportunity for the entire world. Finally, we aim to beat the deadline to end DACA that has been thrust upon us. There are presently two bills before Congress (one of which is bi-partisan), which would preserve DACA; therefore, Congress is not starting from scratch and hope is not lost: 1.) the Bridge Act was introduced by Republican Senator Lindsey Graham on December 9, 2016, and co-sponsored by Senators Feinstein, Durbin, Murkowski, Flake and Schumer. 2.) the American Hope Act was introduced by Representative Gutierrez on July 28, 2017, and has 116 Democratic co-sponsors. The legislative process could result in a successful bi-partisan effort supporting the Bridge Act, which is currently before the Judiciary Committee, or the American Hope Act. We are not giving up hope to continue to support DACA! Vincent Garrett thought Laney College had helped him turned his life around when he finished his apprenticeship and joined the International Brotherhood of Electrical Workers (IBEW 595). But his story and journey had Peralta had only begun. See what led him to help develop the Restoring Our Communities Initiative at Laney College to help support our formerly incarcerated students. 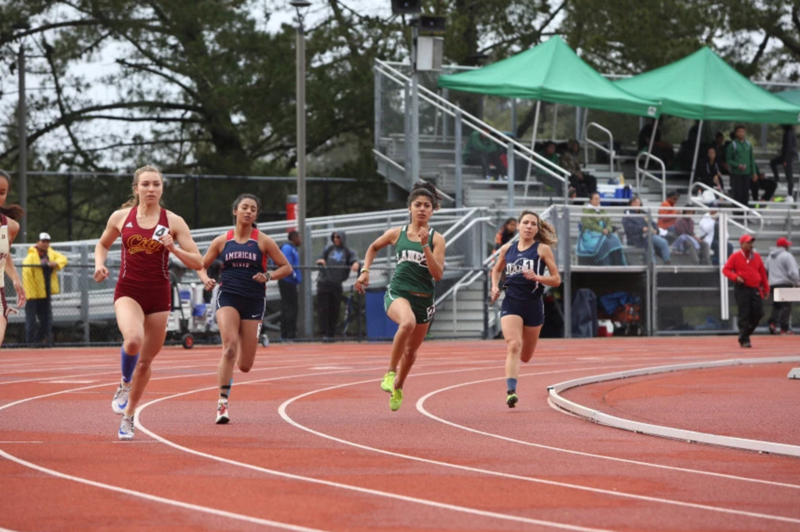 “Just as summer school ebbs and fall classes seem way out there over the horizon somewhere, we find ourselves in the middle of summer with the slow season upon us. 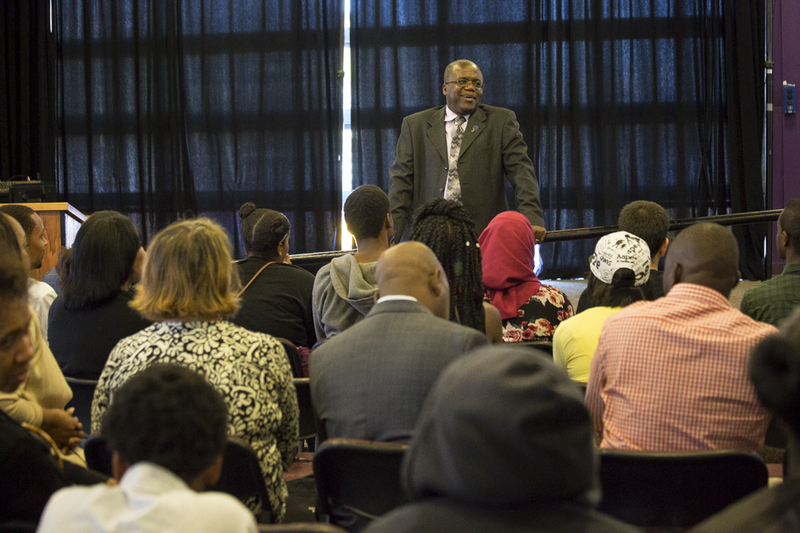 A collaboration between the Psychology department and the Office of Student Activities and Campus Life, the College of Alameda hosted a discussion on ‘Race in the Media’. It was a student-centered workshop that explored topics such as: how being “othered,” stereotypes, and racism impact such important concepts in psychology such as self-esteem and identity. The guest facilitator, Jinni Pradhan provided resources on how people of color and allies can reshape the media to be more inclusive and representative of who many of our Peralta students are and their communities. The College of Alameda strives to raise the consciousness of all people and empower each and every student with tools and information needed to succeed and more fully shape their lives.